The Bossi Castle is located in the town of Castelnuovo Berardenga. Evidence shows that this land was once a Roman settlement. The landscape is unique and beautiful thus inspiring great thinkers, poets and artists throughout the centuries. The Castello Bossi estate was founded in 1983 and has evolved continuously with Marco Bacci’s vision bringing the estate to the highest ranks in international wine. 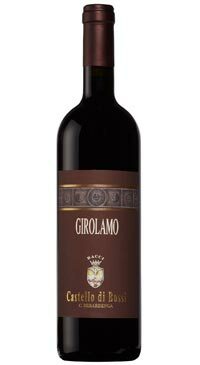 Girolamo is 100% Merlot grown on soils composed of various types of clay and rocks. The wine undergoes 24 months of ageing in barriques and one year in bottle before release. This wine is widely recognized as Italy’s top Merlot.